I was going to buy one of the FlyFly semi scale gliders, now I've sold my Stinson kit I can set my sights higher price wise. This kit is at the top of my list at present, but obviously before committing to such an investment, I'd like to find any comments on it. Here is the link. Are you planing to put a retractable electric SLS in it by any chance? You can buy additional formers to fit a front mounted motor, so it's in the melting pot. I've just had a thought of how to make my own EDF retract system, so that's in the pot also. BTW there are other sources for the kit that don't charge a lot of money to deliver it. 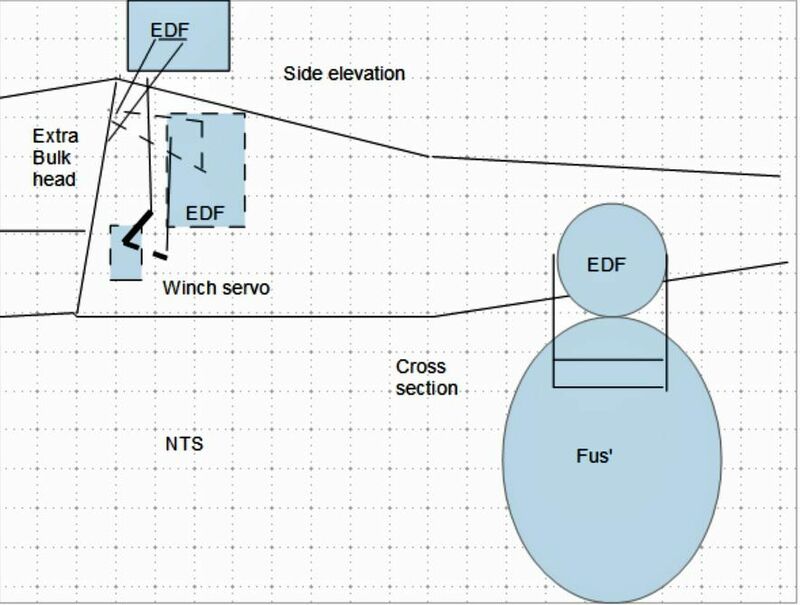 Rough sketch of my EDF retract system. Frank Whittle had to start somewhere. Sequence would be, make the the doors servo operated, open the doors, start the EDF and it will pop up. That would probably result in blowing a hole in the bottom of the fuselage? IMO the EDF must be in position before it starts. The grob acro is a great model I had one myself a few years ago but I would not go for edf I would use again f.e.s instead a lot easier to do and cheaper. Plus you get more power and flight times per battery. A lot of full size gliders are using fes now including the grob so it will be still scale. A folding propeller and a 1000 watt motor . Was it the Reichard Grob you had? Reichard advertise parts to convert it to a nose motor, however, trying to get info from them is very difficult, same applies to the other 2 UK importers I know of. After some more research on the Reichard Grob, I decided it wasn't for me. However, I've taken the plunge & ordered a Pheonix K8B artf. It has a built up fuselage so will be easier to add whatever propulsion method I decide on. I believe it is already set up for a front power unit. The link is to one on YouTube.